The A.E.G. 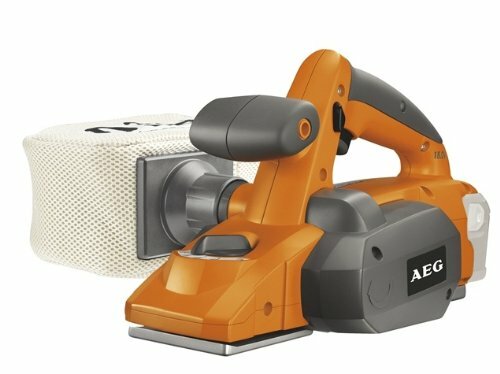 OBHO18 18 volt cordless planer has an 82mm planing width. It has an additional front handle with soft-grip for convenient two handed working and a large dust bag for a dust-free work area. The OBHO18 is fitted with a adjustable depth dial for all types of wooden materials. This planer has a V groove in the front and rear shoe for easy chamfer cutting and an automatic kickstand to protect surfaces from accidental planer contact. The OBHO18 is suitable for left and right handed users and is robust in its design. A die-cast base plate is fitted for high durability and it has a connection for dust bag or absorption systems. A.E.G have used the most up to date ergonomic soft-grip material for the upmost comfort in use. It has a safety switch with lock for safety. Specifications : Voltage : 18 Volt. No load speed : 11,000 /min. Width : 82 mm. Rebate depth : 0 - 12.5 mm. Cutting depth : 0 - 1.6 mm. Weight : 3.1 kg. Bare Unit Version - NO Batteries, Charger or Kitbox.